That’s exactly what I tell everyone when we talk about winter of last year (2012). This may not be the same for everywhere across Canada but particularly in Northern Ontario I’m pretty sure we only had maybe 4 or 5 real snowfalls. The snow would stick around for a bit if the temperature stayed below zero but for the most part it wasn’t around very much. This is an oddity as most recognize Canadian winters being very cold with an abundance of snow everywhere. I was used to it myself. I remember when I was younger how often it would snow and how I used to snowmobile almost every single day. I haven’t owned a snowmobile in several years now but have always wanted to get another one. Last year I thought about getting one but started to notice a lack of snowfall. As the weeks continued I decided I better wait since winter seemed to basically not exist. Sure would be a shame to buy a nice sled and then only get to ride it a few times for the whole year. So with that, I figured maybe I’ll wait and see how next year would be (2013). First off winter took a pretty long time to get here. At the very least I’m thankful there was more snow on the ground for Christmas unlike last year where we had a big family get together but couldn’t do many outdoor activities with dirt and some snow on the ground. It doesn’t seem to be like the winters I remember though. What happened? Is global warming actually taking a toll on our weather this drastically? Am I just imaging the difference to be so significant? There was an exception to snow fall on December 27th 2012. In fact it was quite the exceptional amount of snow. Some places ended up with 50 cm of snow. 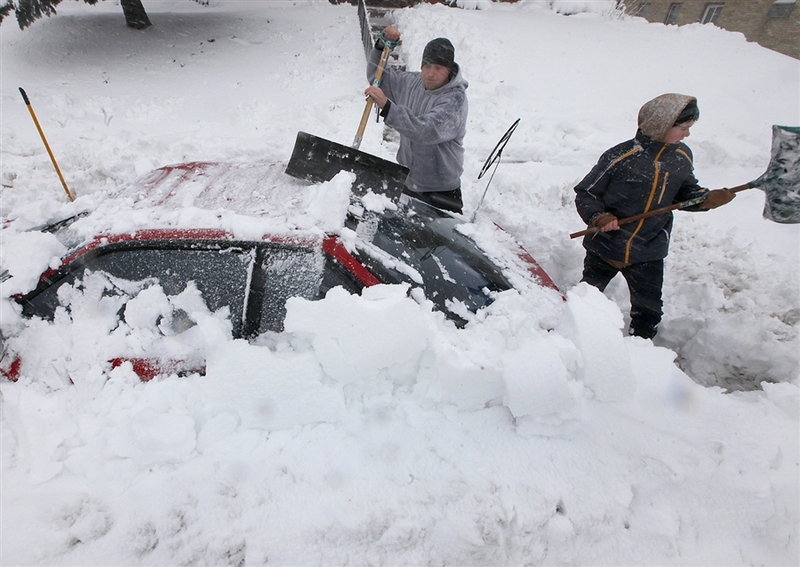 The snowstorm ripped through the United States midsection, particularly Arkansas. It knocked out power and tragically claimed the life of several people. This storm was so ferocious that airplanes were grounded, police had to use snowmobiles, highways had to be shut down, and cars were piled up or sliding everywhere. There was so much snow in Montreal that it actually beat out the previous record snowfall champion of March 1971 that left many without power for 10 days. Although this single day brought on quite the hefty amount of snowfall in many cities, it still pales in comparison to the true records in Canada and the US. The biggest single day snowfall recorded in Canadian history was in Tahtsa Lake, British Columbia with a grand tally of 145 cm of snow on February 11, 1999. That’s a crazy amount of snow for one day! Our neighbors to the south have claim to an unbelievable 192 cm of snow in Silver Lake, Colorado on April 15, 1921. Now that’s an absolutely absurd amount of snow… That’s almost 4 times what Montreal received this year in the most chaotic snowstorm lately. Besides having a ridiculous snowfall there still seems to be a lack of snow. There are many days that warm up over 0 and start melting again. There’s several days where it’s supposed to rain. What happened to the blistering cold winter of the past? Is this going to be the norm for the foreseeable future? I sure hope not, otherwise I’ll never get to buy that new sled. I’m certainly not a meteorologist but it seems like a trend. Not everyone likes winter but most would like it to be full on winter or no snow at all. No one likes the in between of ice, slush or even rain or at least I don’t. A non existent winter with a dash of snowstorm every once in a while. This looks like what we have to look forward to from now on. Guess I better move south because if Canadian winters are getting this sad, I might as well live in full time sunshine. So, is this it?